"The musical blows the dust off your soul." Thirty years ago, Hollywood saluted its singing and dancing stars in That's Entertainment. Now�at last�the Great White Way follows suit with the riveting PBS documentary, Broadway: The American Musical. The six-hour film, directed with energy and flair by Michael Kantor, travels the massive timeline of musical theatre from 1893 to 2004, and along the way honors a host of legendary producers, composers, writers, actors, and choreographers. Talk about an all-star cast! Ziegfeld, Jolson, Gershwin, Porter, Merman, Bernstein, Brice, Berlin, Sondheim, Robbins, Fosse�so many colossal talents, all masterfully woven into an insightful and entertaining tribute to a vital part of American culture. Broadway has long deserved such a comprehensive retrospective, but culling material has always been problematic. After all, how does a director paint a visual portrait of a live medium? Lamentably, before 1980, Broadway never filmed its shows, so Kantor couldn't produce a standard clip fest a la That's Entertainment. Instead, he takes a broader, more creative approach, chronicling Broadway's musical history through recordings, archival photos, vintage TV clips, and scenes from film versions of stage hits. Wisely employing footage and audio of original cast members whenever possible, Kantor offers glimpses of Jill Haworth as Sally Bowles in Cabaret, John Raitt as Billy Bigelow in Carousel, and Mary Martin as Nellie Forbush in South Pacific, among others. Through this inventive format, Broadway brilliantly captures the powerful, elusive essence of live theatre, and examines how musicals reflect and often influence society at large. Julie Andrews hosts each one-hour installment, beginning with Give My Regards to Broadway (1893-1927), which examines the musical's genesis and how figures like Florenz Ziegfeld and George M. Cohan refined it. Vaudeville, minstrel shows, and Tin Pan Alley also helped shape the fledgling form, with songwriter Irving Berlin incorporating the renegade sounds of ragtime into his Broadway tunes. The episode climaxes with the premiere of Show Boat, a landmark departure from the plotless revues that dominated the 1920s. Syncopated City (1919-1933) covers "the most prodigious decade in Broadway history," when talents like George Gershwin, Rodgers and Hart, and Eubie Blake (Broadway's first successful black composer) achieved renown. During the 1920s, women's rights and Prohibition influenced the Great White Way, and stars like Al Jolson and Marilyn Miller reigned. Episode Three, I Got Plenty O' Nuttin' (1930-1942), depicts how, during the Depression, "Broadway offered an effervescent antidote to America's darkest days." In addition to farcical comedies, the timbre of the times inspired directors and composers to shake up traditional formulas�Gershwin wrote the controversial black folk opera Porgy and Bess, while Rodgers and Hart penned the cynical Pal Joey, which featured the first musical antihero. Ethel Merman, Ethel Waters, Cole Porter, and Fred Astaire also grabbed the spotlight during the decade. Oh, What a Beautiful Mornin' (1943-1960) details the Golden Age of the Broadway musical, when the book eclipses the score as a show's most important element. Rodgers and Hammerstein re-imagine the musical with Oklahoma!, adding substance and drama, and choreographers like Agnes De Mille and Jerome Robbins raise dance to new heights. Such timeless classics as Carousel, Annie Get Your Gun, On the Town, Kiss Me Kate, the Pulitzer Prize-winning South Pacific, Guys and Dolls, and My Fair Lady all premiered during this fertile period. The final disc opens with Tradition (1957-1979), which chronicles tumultuous changes in style and form. The advent of rock 'n' roll muscled Broadway out of the cultural mainstream for the first time in its history, and forced musicals to push the envelope to keep pace. West Side Story proved it was "okay to die, to be murdered, to be raped in a musical," and ushered in a new breed of director/choreographer�artists like Bob Fosse, who would stamp shows with their inimitable style. Stephen Sondheim emerged as a major composer, bringing realism and maturity to Broadway with productions such as Company, A Little Night Music, Pacific Overtures, and Sweeney Todd: The Demon Barber of Fleet Street. This fascinating installment also profiles Hair, Cabaret, A Chorus Line, Fiddler on the Roof, and other ground-breaking musicals. Putting It Together (1980-2004) takes us to the present day as it focuses on the changing business of Broadway producing, with big conglomerates like Disney exerting corporate influence, and megalomaniacs such as David Merrick, also known as "the abominable showman," refusing to relinquish control. In the 21st century, according to director Susan Stroman, "It takes a village to put on a Broadway musical," and segments on 42nd Street, Cats, Rent, The Lion King, The Producers, and the current hot ticket, Wicked, prove her point. On film, it's hard to capture Broadway's intangibles, like the symbiotic relationship that develops between live actors and an audience during the course of a musical performance. But through clips, interviews, and a contagious reverence for all things theatrical, Broadway comes close. It may not recreate the energy and exhilaration of live theatre, but this sumptuous, celebratory documentary inspires a deep appreciation for a uniquely American art form that never ceases to thrill and delight. Like the street itself, Broadway generates excitement, and makes one anxious to experience the "hip-hooray and ballyhoo" of the Great White Way as soon and as often as possible. 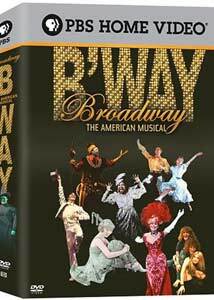 Image Transfer Review: Broadway: The American Musical debuts on DVD with a stunning widescreen anamorphic transfer, distinguished by rich, lush colors and crystal clarity. At times, archival footage can be faded, grainy, and scratchy, but considering the rare media employed, such imperfections are unavoidable. More contemporary clips look better, and the interview segments shine with natural fleshtones, excellent contrast, and sharp details. Audio Transfer Review: The Dolby stereo track enjoys nice presence and depth, and remains free of any annoying defects (except, of course, during vintage recordings). Julie Andrews narrates with impeccable diction and inflection, and her comments�as well as those of interviewees�are always clear and comprehendible. Music quality varies depending on the source material used, but most songs possess good fidelity and warm vocal tones. Extras Review: Each disc is packed with expanded interview segments and additional full-length performances from some of Broadway's brightest stars. The latter includes such gems as Mary Martin and Ezio Pinza singing Some Enchanted Evening from South Pacific, Eddie Cantor rolling his trademark eyes in one of his classic comedy sketches, rare rehearsal footage from Pacific Overtures with Stephen Sondheim at the piano, John Raitt and Jan Clayton crooning Rodgers and Hammerstein's beautiful If I Loved You from Carousel, and Kristin Chenoweth and Idina Menzel performing For Good from the current smash musical, Wicked. More than three hours of interview outtakes feature such varied personalities as Carol Channing, Stephen Sondheim, Mel Brooks, Arthur Laurents, Jerry Orbach, Marvin Hamlisch, Ben Vereen, Harvey Fierstein, Chita Rivera, Kitty Carlisle Hart, Al Hirschfeld, and many other notable craftsmen and critics discussing a smorgasbord of fascinating topics. Disc 3 also includes a 16-minute featurette, Wicked: The Road to Broadway, which follows the Tony Award-winning show from the rehearsal hall to its first workshop production to its out-of-town tryout in San Francisco. Segments on choreography, lighting, direction, and costumes provide an in-depth look at how a massive, multi-million-dollar musical gels. "A million lights, they flicker there; a million hearts beat quicker there�" Yes, that's The Broadway Melody, and PBS's superb documentary, Broadway: The American Musical recounts the history of the Great White Way with insight and panache. The six-hour film flies by in a heartbeat, mesmerizing both diehard musical fanatics and those experiencing Broadway's magic for the very first time. A top-notch transfer and hours of supplemental interviews enhance the three-disc set and cement its stature as the definitive Broadway documentary. Highly recommended.